As a kid, I always looked forward to the arrival of Powder Magazine in my mailbox. I’d read it from cover to cover, multiple times until the pages were crinkled and tattered, study the shots of skiers in the Shooting Gallery, and obsess about every single turn, air, pole plant, angle, and more. I’d cut out my favorite shots and tape them to the walls of my dorm room in school and try my best to replicate the lifestyle and dream I found in those pages on hard pack and ice on the East Coast until I got the chance to make turns in Utah, Colorado, Wyoming, South America and ultimately, California where I worked in the outdoor and snowsports industry for a spell. As time went on, and I shifted out of office work to become a full time musician, those images and words were indelibly burned into my mind as I began to spend more and more time performing in and around ski towns. Despite my parents’ best efforts to the contrary, I either became a ski bum with a music problem or a musician with a ski problem. 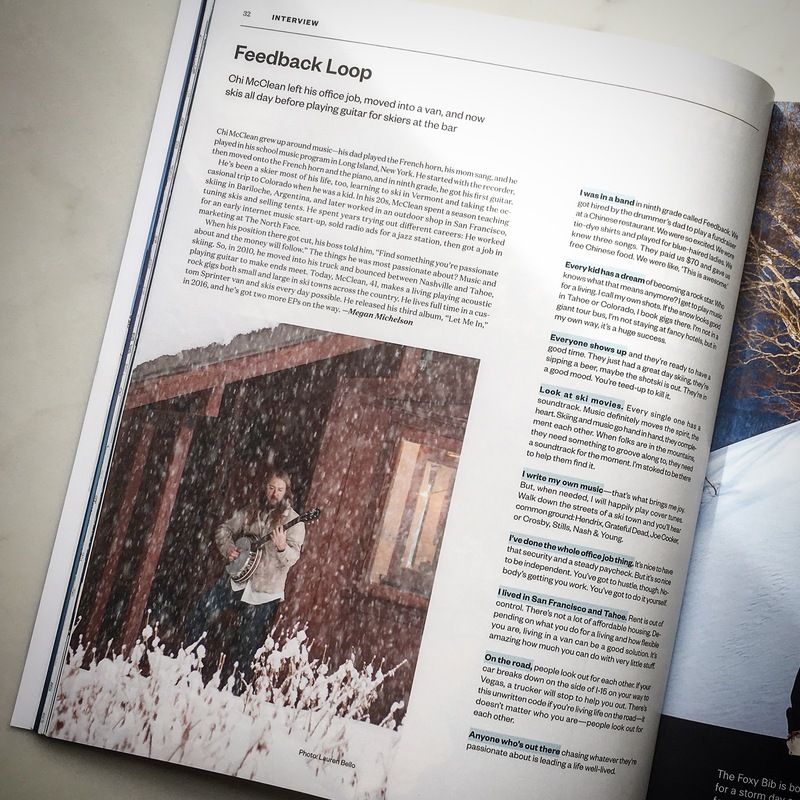 With two new EPs on the way for 2019 – produced by Grammy Award winner, Richie Biggs – the potential for another killer winter ahead, and many years on the road under my belt, it is such a treat to see this little piece in the October 2018 issue of Powder Magazine. Big thanks to Megan Michelson for championing the story, Lauren Bello Okerman for the photo, and of course, Deering Banjos, Elixir Strings, Taylor Guitars and Franklin Strap for their ongoing support of my music and my career. Special thanks to Outside Van for building the perfect ski, surf, bike and music “green room on wheels” that has largely enabled me to pursue the life that I love. Of course, big ups to all of the venues that have welcomed me back, year over year and all the friends and extended family that have generously offered up a parking spot when the snows got heavy, or a shower when Van Guy got stinky. Without each and every one of them, none of this would be possible. Let it snow! This entry was posted on Tuesday, October 2nd, 2018 at 8:14 AM. You can follow any responses to this entry through the RSS 2.0 feed. Both comments and pings are currently closed.